PV-T, which is hybrid Photovoltaic and Thermal collector, production of both electricity and hot water is done simultaneously. The PV module's heat is absorbed to produce hot water so that PV efficiency can be optimized as the heat is transferred into fluid to produce hot water. Nowadays, the most people and countries like to be self supporting for their own energy needs, they are looking most of all to the durable energy sources like the sun, water and wind or geothermal. The systems, which are most commend on the market now supply only electricity or only heat. Let use look to the Sun. The sun is source of infinite and it generates 10.000 more energy than what the world consumes. There are two systems very common to used this energy. First we have the solar collector that makes normally hot water out of the energy from the sun. 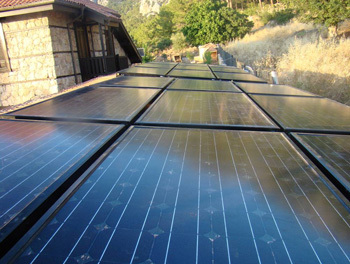 Second there are PV (Photovoltaic) modules, which convert sun lights into electricity. Both systems are increasing its popularity every day. Both systems have normally a black or dark surface that is looking to the sun, a black surface is a sobering the solar energy and while be heated for the solar collectors that is the meaning but if a PV module while be heated is while lost the capability to make electricity and these output lost is about 0,5 % for every Kelvin degrees, so every 10 degreed rising of the temperature from a PV module means a loss of about 5% of electricity output. To solve this problem scientists have been working on different methods. The most promising one is “cooling pv cells with fluid”. In the PV-T, which is hybrid Photovoltaic and Thermal collector, production of both electricity and hot water is done simultaneously. The PV module’s heat is absorbed to produce hot water so that PV efficiency can be optimized as the heat is transferred into fluid to produce hot water. 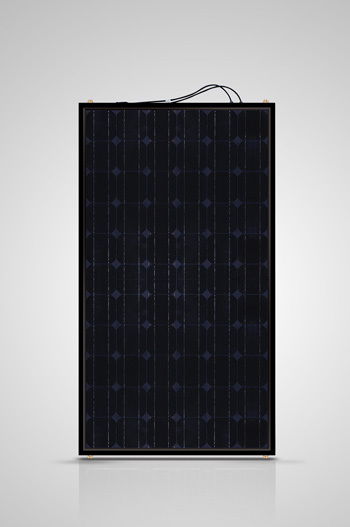 By courtesy of PV-T hybrid collectors to enable that following these issues: It has been increased performance electricity production of PV module. Hybrid PV / T systems covering areas where electricity and heat energy produced from the total, half of this field with PV modules, the remaining half of the thermal. Thermal collectors and PV modules to be installed side by side and creating trouble in terms of availability and use of cause visual pollution. PV / T modules, the electricity and hot water in the same area produced a space-saving although the image and reduce environmental pollution is a major contribution. Hybrid PV/T systems ROI is shorter than the PV systems. Consequently, in the PV / T systems can reduce the temperature of PV cells cause the cells are increasing lifetime and efficiency. Out of calculations done by several scientists organization and university comes that if a normal family house in the north part of Europe can make all his energy what is used in the whole year with only 25 square meters of PV-T collectors To store the electricity we can use normal batteries or hydrogen with a fuel cell. To store the heat from the summer we can make used of a ground storage like is done by the drake lake solar project where we heat 52 houses the whole year with solar energy.